Our team of skilled hairstylists are highly trained in the newest trends, innovative colouring techniques and styling designed to fit your lifestyle. Our stylists regularly attend industry courses and participate in regular and on going training. People often tell us it is so nice to have a hairdresser that listens and communicates to achieve the best possible outcome for their hair. ABOUT | Has been at Crew Stylists since 2004 and is a born and bred Kiwi. STYLE STRENGTHS | All aspects of hairdressing, particularly colouring. Makeup artist and wedding hair specialist. STYLE STRENGTHS | Hair-up and styling specialist, Barbering and on trend ladies fashion cuts, modern colouring techniques especially balayage and ombre techniques. 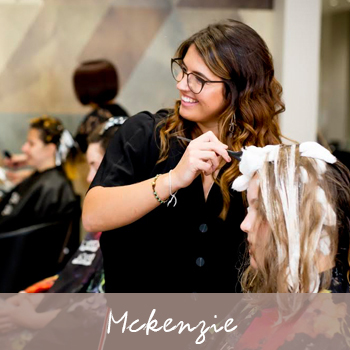 "Mckenzie is a fun, confident stylist, her passion for hair and modern styling techniques always makes me leave the salon feeling 10 years younger"
STYLE STRENGTHS I Women's and Men's modern cuts, colouring, foiling and hairups. "Cassie loves being creative and ensures to listen to my every need. She's passionate about making me look and feel great"
Available - Tuesday 9-5.30, Wednesday 9-5.30, Thursday 9-8, Friday 9-5.30 and Saturdays 9-5. STYLE STRENGTHS | Blow drying, cut and colour , treatments, scalp massage and makeup artistry. "Debora is focused on me and makes me feel so special, her scalp massage and treatments are just amazing, she is calm and caring and i leave the salon feeling pampered"
Joined Crew Stylists in 2018, and has been in Queenstown since 1994. STYLE STRENGTHS | All aspects of hair styling and makeup. From Brazil Vanessa is a delightful, warm and ambitious Apprentice stylist. Just at the beginnning of her career in hairdressing in 2019, Vanessa is proving to be a huge asset to Crew, completing her first Loreal Colour Keys course she is keen to learn and does training on a Wednesday morning. We are always looking for hair models so please call and leave details if you are keen!! Available - Tuesday - Saturday.